There are many types of mulch. You will select them for different purposes and use them in different ways. Many are organic such as wood chip or grass cuttings, some like polythene or gravel are not actually organic but nevertheless they’re put to good use in an organic garden. Investigate the 3 catagories above. Autumn is the main time for mulching. Then it retains heat in the soil over winter giving a higher starting temperature in the new season. It also protects delicate soils from the ravages of winter rains and erosion. In spring the mulch can be removed before planting and sowing and to let sunlight warm the soil. Once the new plants are established in early summer, new garden mulch can be applied to conserve soil moisture through the dry summer months. ‘No dig’ gardeners and organic gardeners of raised beds may apply mulch continuously. Here an organic mulch is breaking down over time to form good organic soil. An important reason for adding a layer of mulch is simply to keep the soil covered and protected where no plants are growing and especially when the surface is open. Permanent areas of bark or gravel mulch can be established around conservative features such as ornamental trees, shrubs and pathways. 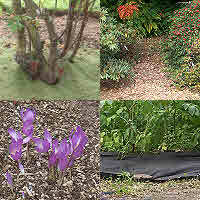 For details check out my pages on fabric/sheet, organic and landscape mulches.